Ranked by Forbes in 2011 as one of Africa’s Top 10 most ‘Powerful and Influential Men’ of his generation, Euvin Naidoo is the Head of Strategy for Barclays Africa, Regional Management, where he focuses on a 12 country pan-African footprint incorporating the corporate and investment bank, retail and business bank, and wealth and insurance businesses outside of South Africa. 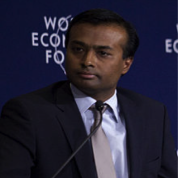 A graduate of the Harvard Business School, Naidoo is also an alumnus of global international management consulting firm McKinsey & Co., having started his career at the Firm in the 1990s with a focus on business in Africa concentrating on innovation within financial services (insurance/investment management/risk), telecommunications (fixed and mobile), metals & mining (steel and coal) and airlines/transport (operational efficiency and marketing). He is passionate about the impact leadership and communication can have on individuals and communities. In 2007 he was asked to deliver the opening address at TEDGlobal. In 2014 he successfully developed and taught Oxford Business School’s inaugural “Doing Business in Africa” course, a week-long advanced MBA immersion focusing on a practitioner’s approach to successfully growing businesses in emerging markets. New York based Columbia University’s Journal of International Affairs has named Naidoo, alongside pan-African mobile telecoms pioneer Mo Ibrahim, as one of the ‘Five Faces of African Innovation and Entrepreneurship’. "It is ultimately through education that the long term societal transformation of a better life for all can be achieved- for this we need teachers who inspire not just learners but colleagues and institutions. I support the Global Teacher Prize as it is a beacon call to all, driving an exchange of ideas across borders as we recognise pioneers and unsung heroes in communities across the globe, working every day to make an impact on the most important resource we have on the planet- our children and youth."